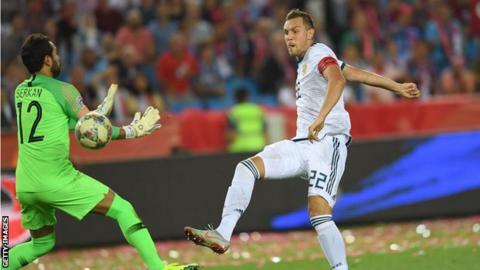 Artem Dzyuba continued his fine international form as he scored the winner for Russia in their Nations League opener against Turkey. The World Cup quarter-finalists took the lead in their Group B2 match through Denis Cheryshev, scorer of four goals in the summer. Russia were pegged back by Serdar Aziz's strike. But Dzyuba, who scored three World Cup goals, was the hero again with a low drive to earn all three points. Sweden, the other side in the group, host Turkey on Monday. Match ends, Turkey 1, Russia 2. Second Half ends, Turkey 1, Russia 2. Attempt saved. Hakan Calhanoglu (Turkey) left footed shot from the centre of the box is saved in the bottom left corner. Cengiz Ünder (Turkey) wins a free kick on the right wing. Foul by Georgi Dzhikiya (Russia). Offside, Russia. Yuri Gazinskiy tries a through ball, but Artem Dzyuba is caught offside. Okay Yokuslu (Turkey) wins a free kick in the defensive half. Foul by Artem Dzyuba (Russia). Hand ball by Cenk Tosun (Turkey). Attempt saved. Hakan Calhanoglu (Turkey) right footed shot from the centre of the box is saved in the bottom right corner. Attempt blocked. Yunus Malli (Turkey) right footed shot from the right side of the box is blocked. Assisted by Cengiz Ünder. Artem Dzyuba (Russia) is shown the yellow card for a bad foul. Kaan Ayhan (Turkey) wins a free kick in the defensive half. Artem Dzyuba (Russia) hits the bar with a left footed shot from outside the box. Assisted by Pavel Mogilevets. Attempt blocked. Yunus Malli (Turkey) right footed shot from outside the box is blocked. Assisted by Cengiz Ünder. Attempt missed. Oguzhan Ozyakup (Turkey) right footed shot from outside the box misses to the left. Assisted by Hakan Calhanoglu. Offside, Russia. Mario Fernandes tries a through ball, but Aleksey Ionov is caught offside. Corner, Turkey. Conceded by Konstantin Rausch. Substitution, Russia. Konstantin Rausch replaces Fedor Kudryashov. Foul by Pavel Mogilevets (Russia). Corner, Turkey. Conceded by Andrey Lunev. Attempt saved. Cengiz Ünder (Turkey) right footed shot from the right side of the box is saved in the bottom left corner. Assisted by Oguzhan Ozyakup. Substitution, Russia. Aleksey Ionov replaces Denis Cheryshev. Delay in match Fedor Kudryashov (Russia) because of an injury. Substitution, Russia. Pavel Mogilevets replaces Daler Kuzyaev. Foul by Hakan Calhanoglu (Turkey). Yuri Gazinskiy (Russia) wins a free kick in the defensive half. Substitution, Turkey. Yunus Malli replaces Mehmet Topal. Attempt missed. Kaan Ayhan (Turkey) header from the centre of the box misses to the left. Assisted by Hakan Calhanoglu with a cross. Hand ball by Denis Cheryshev (Russia). Attempt saved. Hakan Calhanoglu (Turkey) right footed shot from the left side of the box is saved in the centre of the goal. Assisted by Oguzhan Ozyakup. Attempt blocked. Denis Cheryshev (Russia) left footed shot from the centre of the box is blocked. Oguzhan Ozyakup (Turkey) wins a free kick on the left wing. Foul by Aleksandr Erokhin (Russia). Foul by Denis Cheryshev (Russia).